Baltray rarely resembles the sun-baked savanna but South Africa's Christo Lamprecht looked right home as he became the youngest winner in the 76-year history of the East of Ireland Amateur Open at a firm and fast County Louth. Just 12 months after Reece Black became the event's youngest champion at the age of 17 years and 11 months, the six-feet seven-inch giant from Pinnacle Point Golf Club shaved seven months off that record as he followed a morning 69 with a one-under 71 on a scorching afternoon to win the title by two strokes from Kilkenny's Mark Power on 14-under par. In doing so, he became the championship’s first overseas winner and after honing his links game in the Irish Amateur Open at Royal County Down and practising at Ardglass, Portmarnock, Royal Dublin and The European Club — as well as Eisenhower Trophy venue Carton House — he was thrilled to join the likes of Darren Clarke and Paul Dunne on the list of great winners. “Last year I won the South African Am, that’s been my biggest win so far but this is right up there,” Lamprecht said after a deft chip and putt birdie at the 18th secured the title after an exciting final round charge from Ireland's up and coming talent Power, who was playing two groups in front. It was a case of history repeating itself on Irish soil as Lamprecht, a product of the Louis Oosthuizen Academy, followed in the footsteps of his mentor, who captured the Irish Amateur Open at Royal Dublin in 2002 and went on to lift the Claret Jug at St Andrews eight years later. Whether an Open Championship also lies in store for Lamprecht remains to be seen but with benefactors like billionaire Johann Rupert donating R10 million (close to €700,000) to the GolfRSA National Squad in January — South African amateurs will continue to gain invaluable experience abroad. Irish golf can also look to the future with confidence after Power, who turns 18 on Saturday, scorched through the field with closing rounds of 69 and 68 to finish second on 12-under-par. “I’ll take it,” said Power, who intends to take up a scholarship at Wake Forest University on a golf scholarship next year. 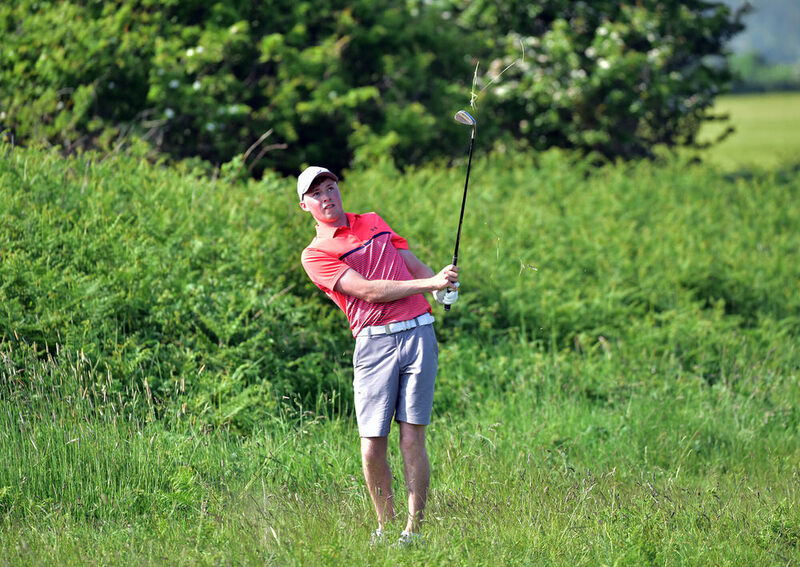 Oughterard's Devin Morely (20) — one of the stars on the University of Louisville team — also has a great week, carding rounds of 69 and 73 in the final group yesterday to finish tied for third with Dundalk's Caolan Rafferty and Massereene's Tiarnan McLarnon, who eagled the 18th, on 11-under. After carding rounds of 66 and 68 to take a one-stroke lead over Morley into the final day, Lamprecht didn’t have it all his own way yesterday. Rafferty (26) scorched around the firm and fast links in 66 in the morning to move to within a shot of the leader, tied with Morley, on 12-under with a round to go. A Paddy Harrington Scholarship student at Maynooth University, the local man then moved into the lead on 14-under par after picking up two shots in the first six holes before bogeys at the eighth, 10th an 11th undid his challenge. A maiden win cannot be far away for Rafferty, however, or for Morley (20), who was just two shots behind with three holes to go before he found sand and bogeyed the 17th. Lamprecht wobbled with a bogey at the 11th but bounced back with birdies at the 12th and 13th to build up a three-shot cushion. But he then bogeyed the tricky 14th and when Power got to within one with his sixth birdie of the afternoon at the 17th, a nail-biting finish ensued. Lamprecht was equal to the task, however, and followed solid pars at the 15th, 16th and 17th with a tidy chip and putt birdie at the 18th to seal the title. 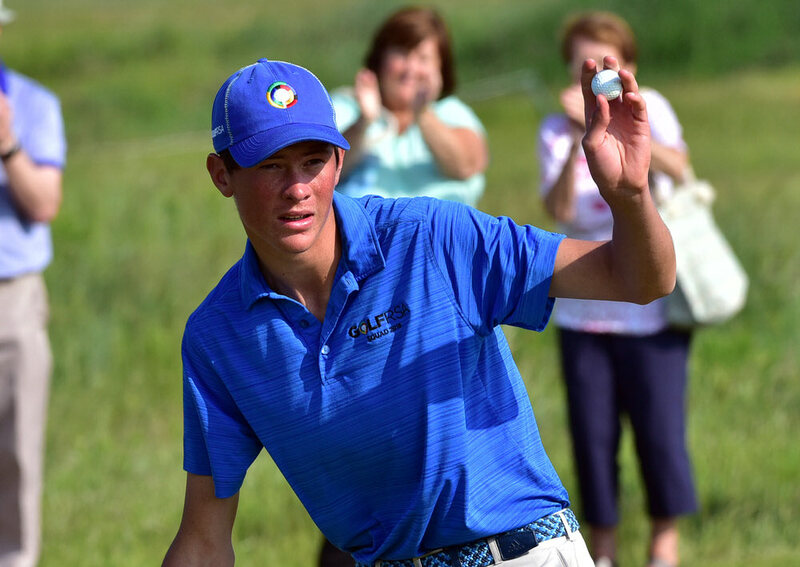 “Those two birdies on the back nine really settled me down and gave me a lot of confidence,” said Lamprecht, who hit a seven iron to five feet at the 12th and a sand wedge to four feet at the next to move to 14-under. “Definitely playing a lot of links golf and getting used to where you want to pitch it and letting it run, stuff like that; it is really helped a lot. The fourth highest South African in the World Amateur Golf Rankings, he could yet make the three-man South African team for the Eisenhower Trophy when the World Amateur Team Championships are played at Carton House later this year and given his cool under pressure, he’d be an asset. He heads now to the St Andrews Links Trophy where he will see some familiar Irish faces trying to deny South Africa another famous victory at the Home of Golf. 304 A Dowling (Hermitage) 72 72 79 81. Mobile phone shop manager Colm Campbell was dialled-in as he fired a 68 to grab a share of the lead with defending champion Paul Dunne in the East of Ireland at Baltray.